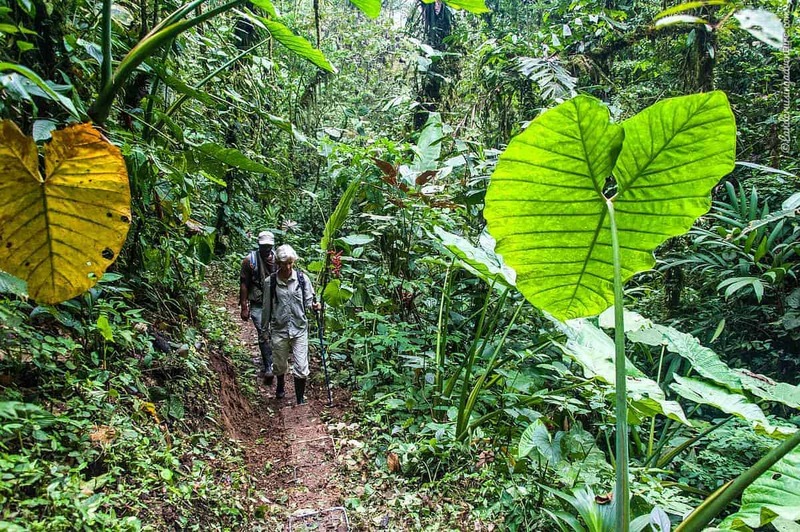 Two hours north of Quito, Ecuador’s capital, we hit a dirt road and left civilization behind. 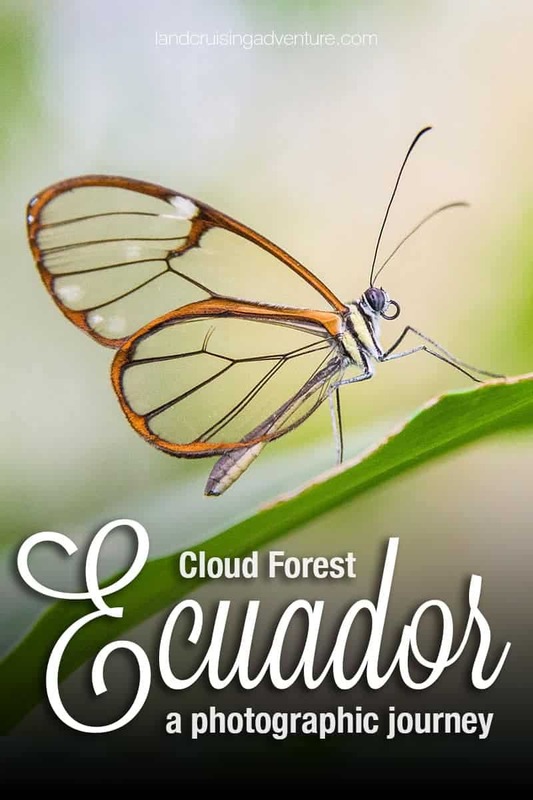 We entered the cloud forest, an evergreen moist forest that characterizes a large part of the country’s landscape. A gate indicates the entrance to the 3,200-acre Mashpi Reserve, which protects an important part of the Choco Forest that stretches far into Colombia. 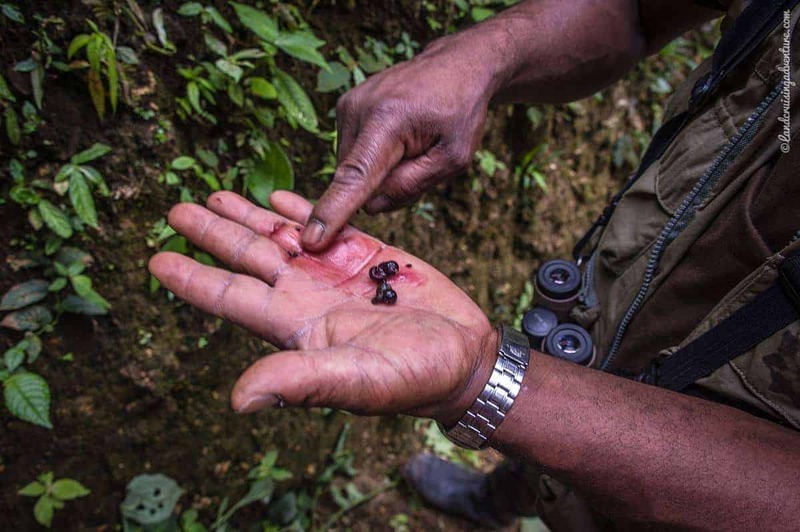 Eighty percent of this incredible biodiverse forest has already been destroyed and, as a result, much of the endemic flora and fauna is on the verge of extinction. 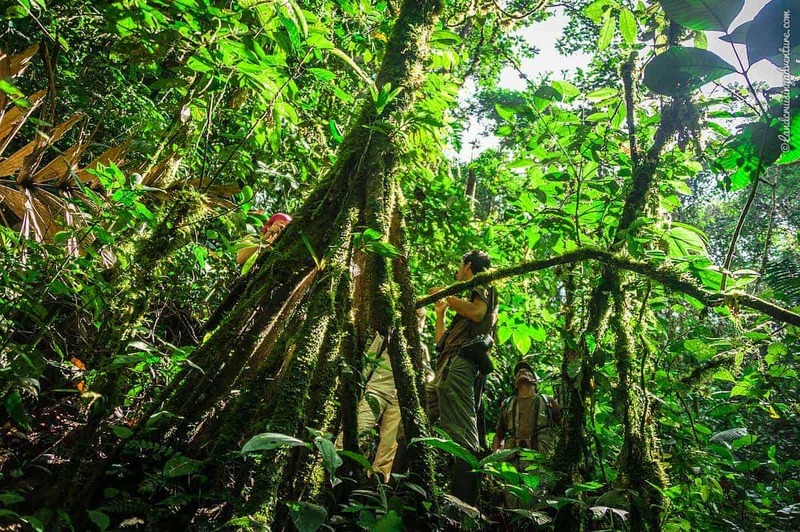 Apart from an abundance of plant species, an estimated 500 species of birds (some 35 are endemic) share this home with animals such as monkeys, peccaries, ocelots and anteaters. 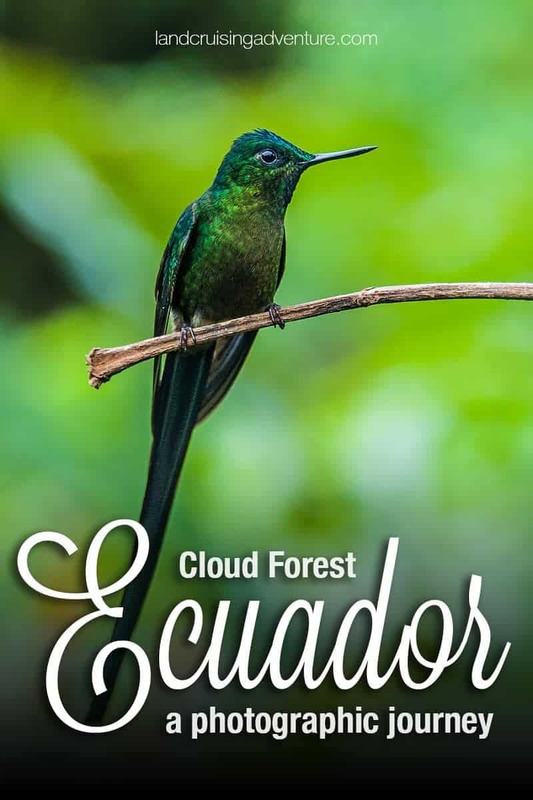 Coen and I had been invited to stay at the Mashpi Eco Lodge, which lies in the heart of this reserve, to see hummingbirds, butterflies, and orchids but soon discovered that this cloud forest is much richer than that. Coen captured the intricate details of the reserve on camera. This may seem an outrage, what kind of detail is plastic in a cloud forest? 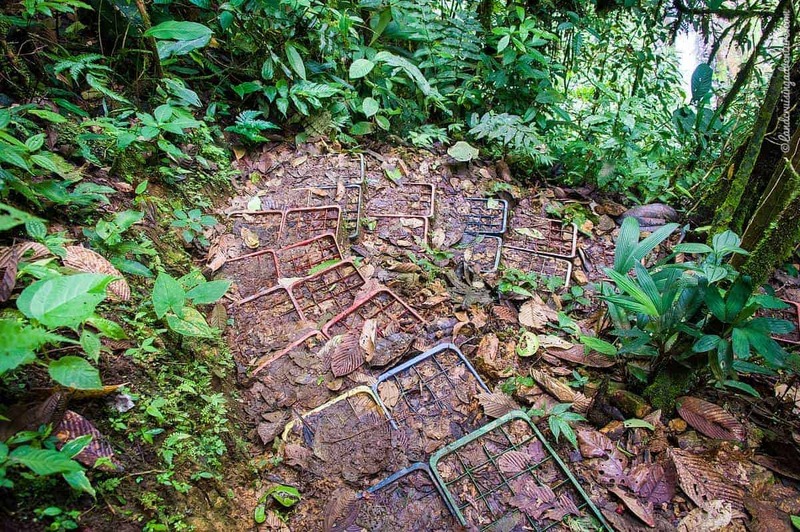 Yet the crates are worth mentioning as they play an important role in the preservation of trails, which in rainforests are often muddy, slippery and sometimes dangerous. In most cases they are repaired and reinforced using wood or bamboo. One of Mashpi’s expedition managers concluded this was a never-ending battle and that having to cut so much wood wasn’t, in fact, ecological at all. So he decided to use some 7,000 recycled beverage crates instead. It doesn’t look particularly beautiful with edges sticking out, but it is very effective. The crates will last 150 years, so there’s no need to replace them any time soon, and they stop the trail from becoming slippery. But there is more to it. Because of the way the crates are stacked, the weight of each footstep is spread over a large surface, which minimizes the impact on the soil. Instead of the soil becoming so compacted that once the trail is abandoned, it will need years to recover as is the case with regular trails, these trails can recover – when abandoned and the crates dug up – within two or three months. Of course, soaps and detergents were used long before technology enabled mankind to produce them synthetically. 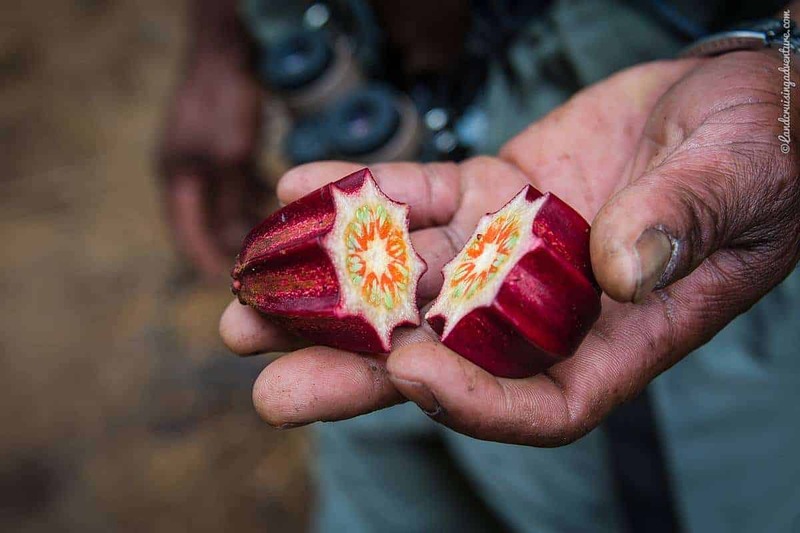 For example, in Asia the soap nut of the Sapindus is well-known, and during our visits to indigenous people in Brazil we learned they have their own plants that can be used as soap as well. 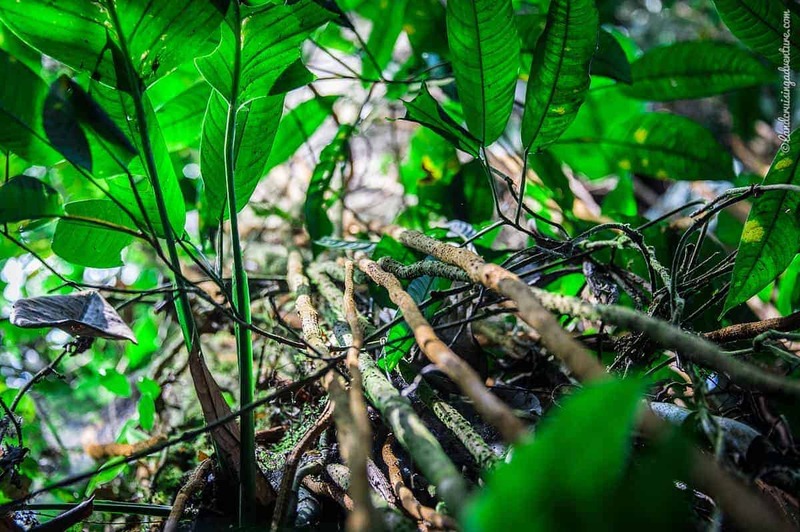 Here, around Mashpi, people have traditionally used the berries of this plant, called jaboncillo, which are rich in saponin. Around Mashpi the plant is known as rascadera. It grows enormous leaves and is nicknamed ‘elephant ear’. It is also called the ‘poor man’s umbrella’ because the leaf hardly ever gets damaged and people in the countryside therefore effectively use it as an umbrella. You can touch the leaf without a problem, but if it is damaged by you (or an insect), a white, toxic liquid will seep out. This liquid can burn your skin and itches so much that you will scratch your skin open. So, as our local guide José explained, in order to use a leaf as an umbrella you have to cut the stem low enough for the liquid to seep out below your hand. 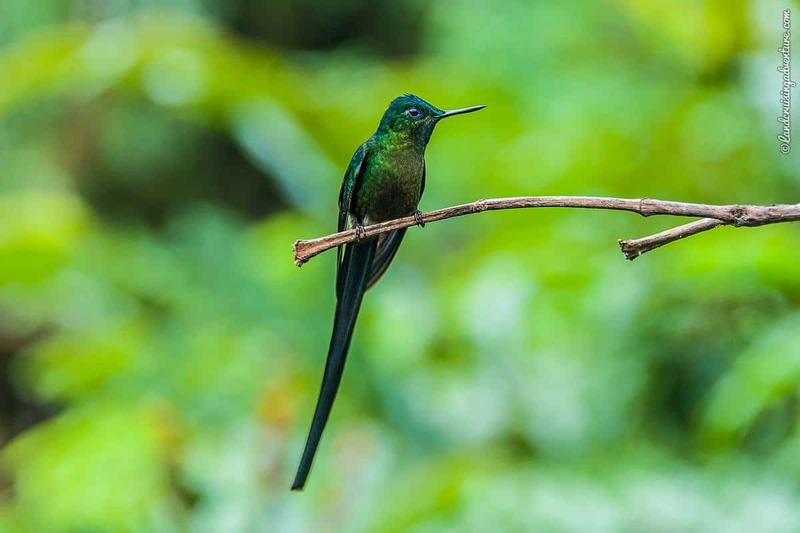 Some thirty different hummingbirds have been identified within the reserve, among which endemics such as the Velvet-Purple Coronet and the Brown Inca. At the reserve’s hummingbird observation station we admired about a dozen different ones, some with fairy-tale names, such as Purple-Crowned Fairy, Green-Crowned Wood Nymph, Violet-Tailed Sylph. We struck it lucky and also got to spot a coati, toucans, and several types of tanagers. 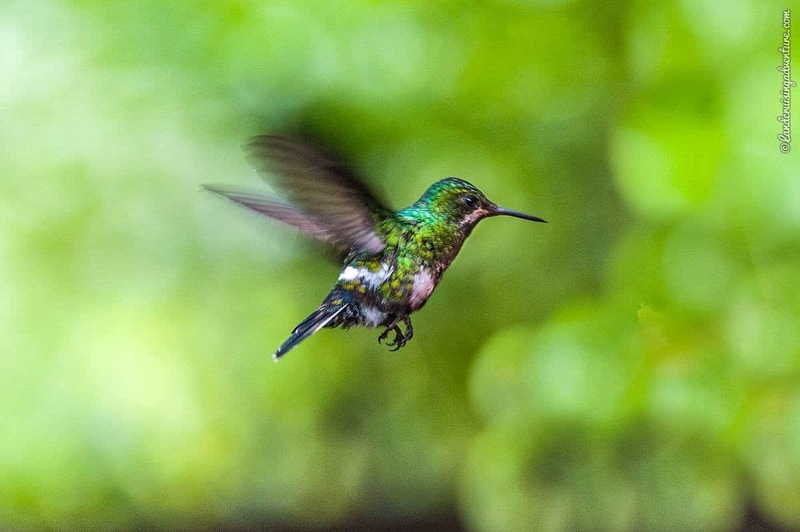 Here are more fantastic photos of the hummingbirds we spotted here. Locally they call this flor de campo, which belongs to the genus of Clusia. Flor means flower in Spanish but, in fact, this is a fruit. It is not edible for people, but it is for certain animals. People use it as a stamp: when the fruit is cut open it reveals an incredible star-shaped pattern, which is used to decorate fabric. 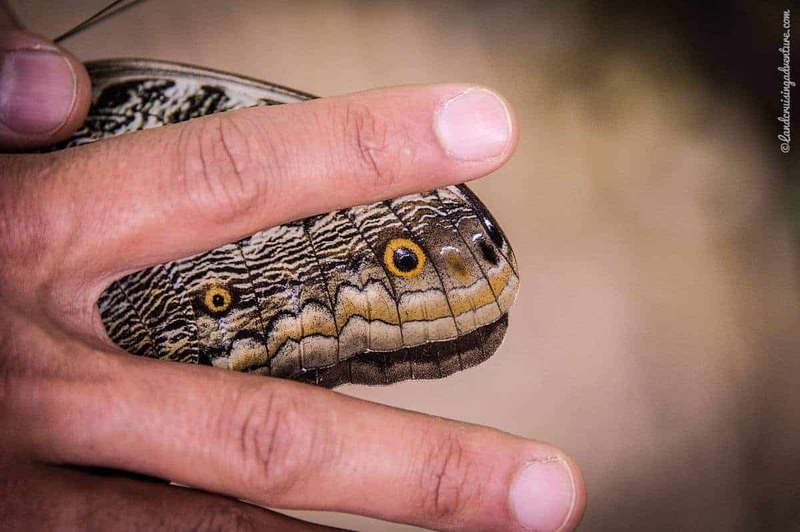 While hiking to a waterfall, the 85-foot-high observation tower, or the butterfly farm, we came across giant land snails. 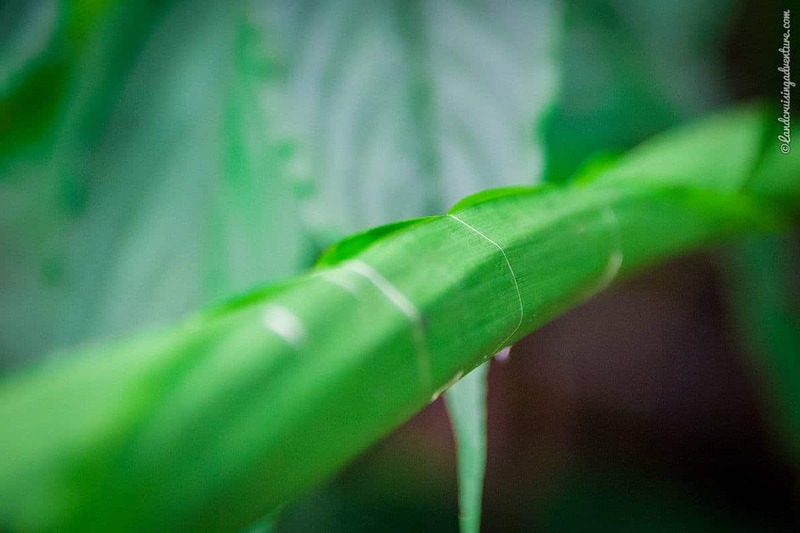 According to José, who has lived in this cloud forest his entire life, its slime is used to make a facial lotion. 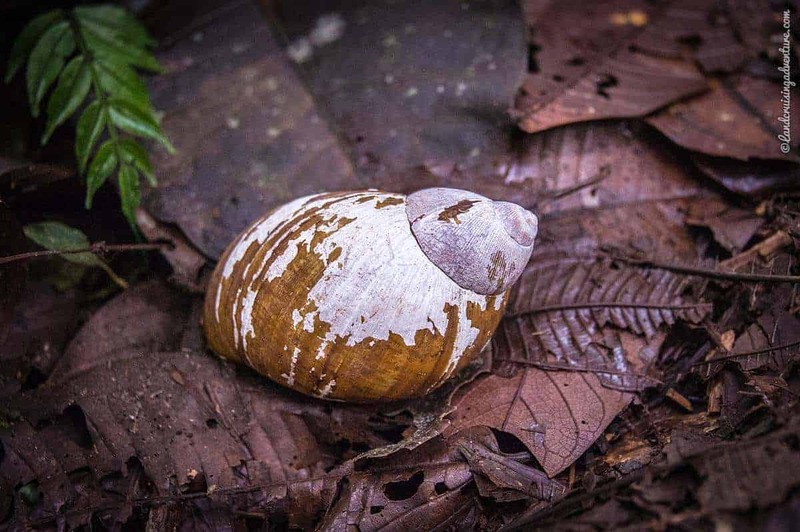 The meat of this snail can weigh up to a pound and is locally eaten as a ceviche. Ecuadorian ceviche typically is a cooked, soupy seafood dish with sliced onion, tomato, lemon, cilantro and salt, and is served with tostada (roasted corn kernels) and chifles (banana chips), but the main ingredient can vary. You can also have a mango ceviche, mushroom ceviche, or as here: a giant land snail ceviche. 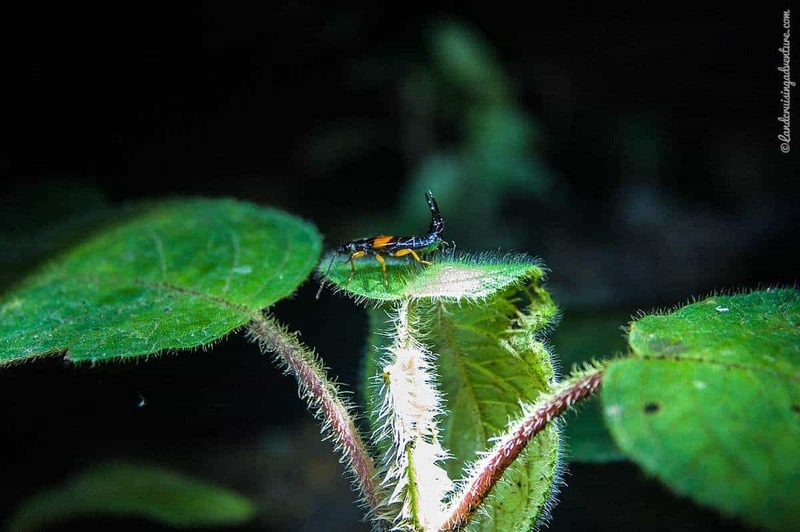 Thanks to its tropical location, Ecuador has one of the richest insect varieties in the world. Hence we can’t really blame our guides when they can’t come up with the right names for every single crawling creature we are interested in. Coen spotted this beautiful creature on his skybike ride and David suspects it may belong to the family of hemiptera, or true bugs. 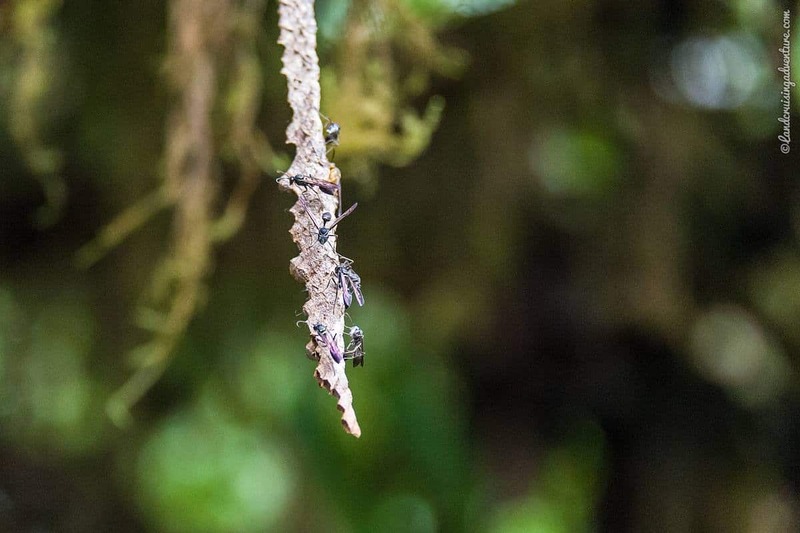 A beautiful sight while sky biking along a 655-foot cable among Mashpi Reserve’s 100 to 130 foot high treetops: watching how wasps were building a new nest. Another sight seen from the skybike through the cloud forest were these red creepers winding their way among trees, which belong to the Gesneriaceae family. According to our naturalist guide David, in this reserve red and yellow flowers specifically attract hummingbirds, whereas other colors are more attractive to certain insects. Coen has an incredible eye for detail and spotted this insect with pincers at the end of our nocturnal walk before any of the guides did. David says it is one they don’t see very often. This fig is a hemiephiphyte, meaning that it begins life as an epiphyte in another tree. Its roots find their way down into the ground, winding themselves around the trunk of its host. Over time the roots will engulf the host tree until the plant, now tree, can stand on its own. One of the lodge’s activities is a nocturnal walk, during which we saw totally different animals than during the day. 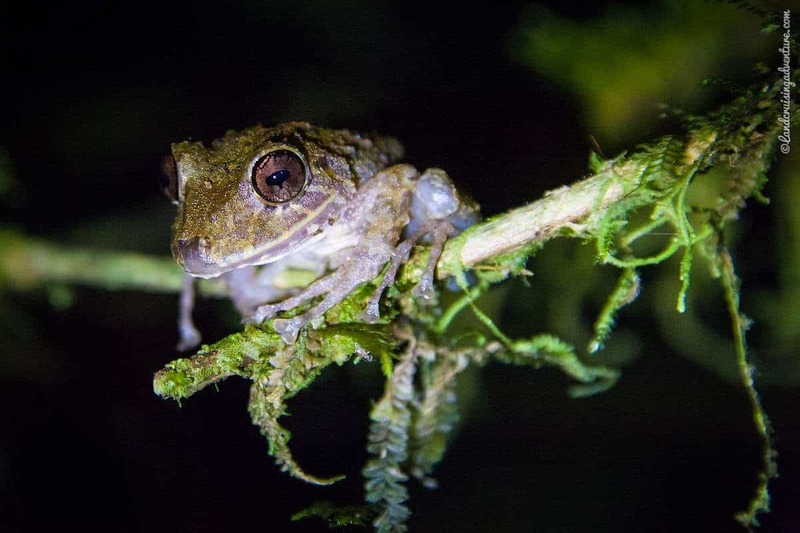 This little nocturnal frog belongs to the genus of pristimantis and sat dead quiet under the illusion – or in the hope – we wouldn’t spot it even though Coen took minutes to properly light it with a lantern in order to take a photo of it. 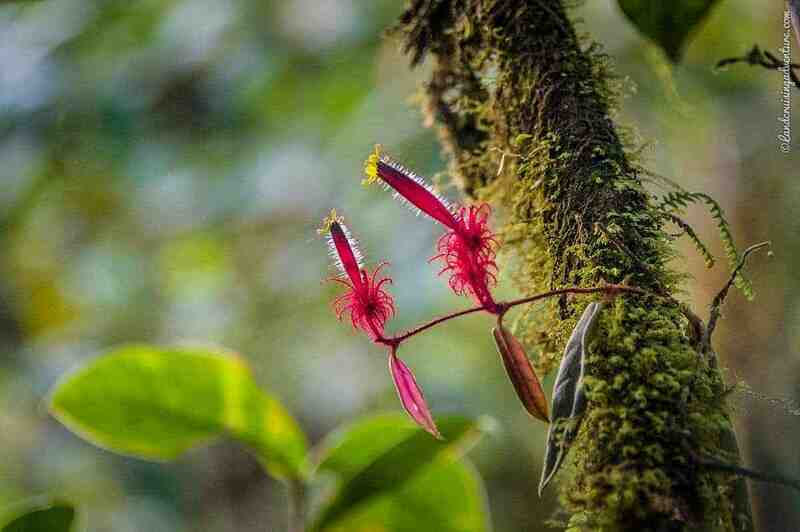 One of the reasons for Roque Sevilla, the owner of Mashpi’s Eco Lodge and the Reserve, to preserve this cloud forest was to protect its abundance of orchids. 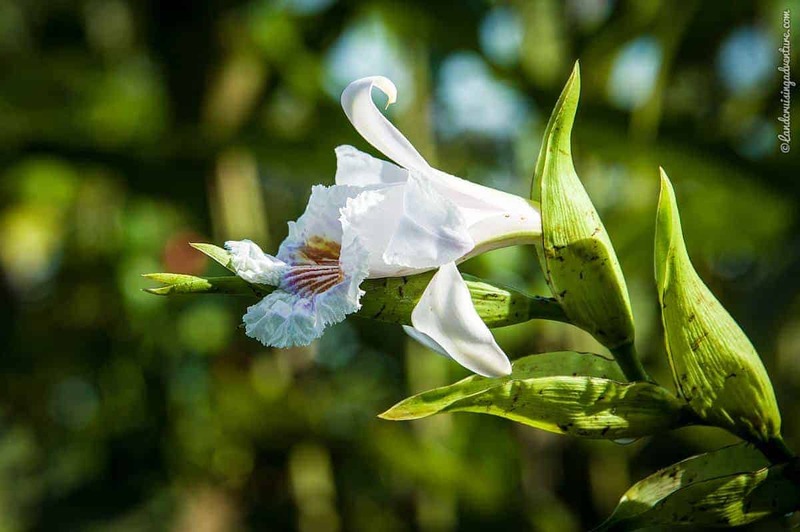 The reserve is home to hundreds of orchid species, among which many newly discovered ones. This is one of the tallest orchids in the world and can grow to up to 26 feet. Orchids are the only flowers that have no nectar. They attract the right animals needed for pollination in different ways, depending on the type of orchid. While this is a nice-smelling orchid, others carry the stench of rotten garbage to attract certain insects. 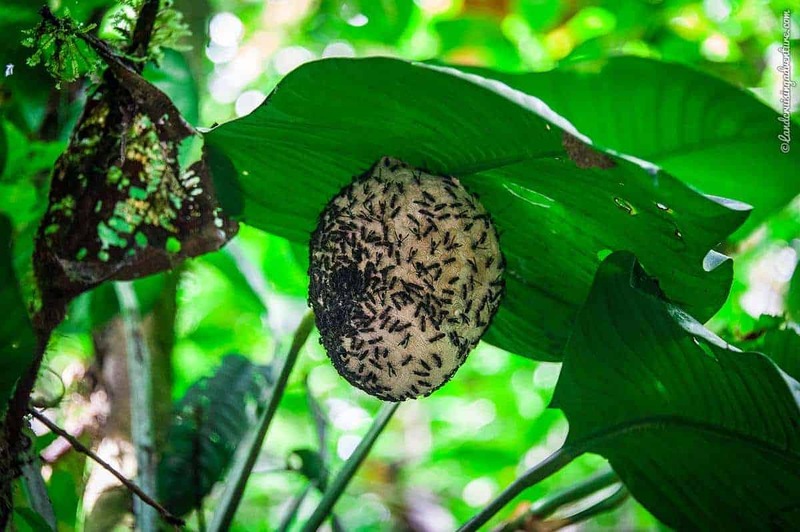 There are even orchids that produce a kind of drug that some insects are attracted to. Initially we took this for a young plant, but it wasn’t. 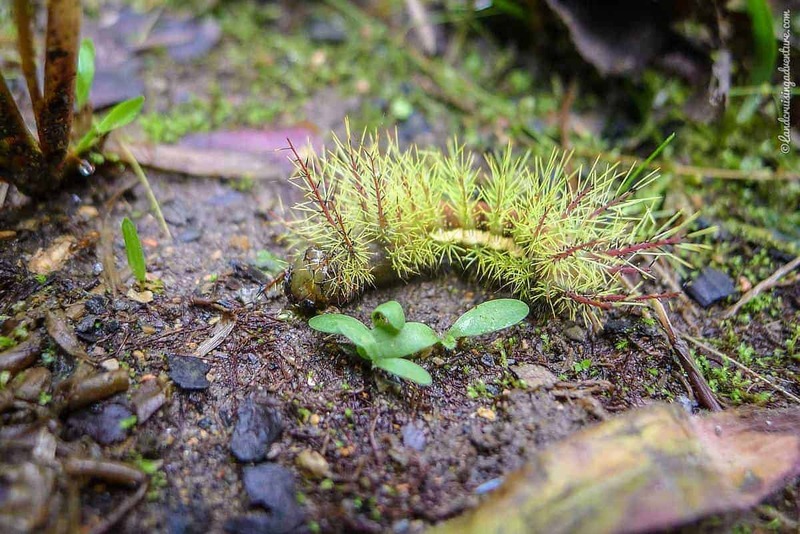 The guides didn’t know its name but José did know not to touch this caterpillar, as it stings. 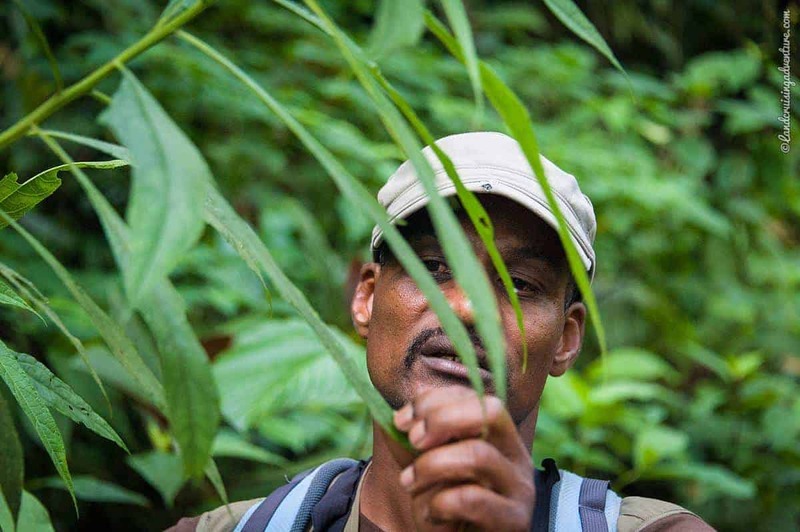 José explained that the leaf of this verbana plant has two important medical applications. 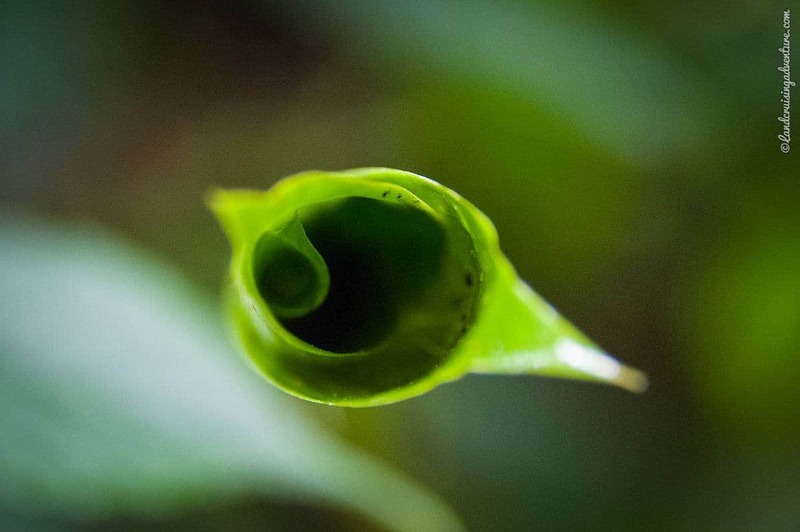 First, by boiling two liters of water with these leaves down to one, you will get a liquid that you can drink to ward off a severe cough and a sore throat. Second, by extracting the juice from the leaves and drinking it, which is incredibly bitter, local people fight off paludismo – a type of malaria. While hiking down to the butterfly center, we came across this wasp nest. José calls them quita calzon, which can be translated as ‘take off your clothes’. It is a nickname used for these paper wasps because when a nest attacks you, the wasps will get into your clothes and sting all over. You have to remove all your clothes to get rid of them. These ants, belonging to the Eciton family, are also called soldier ants. They swarm in such large numbers, up to 200,000, that they can even kill and eat lizards and frogs. Having said that, scorpions, spiders, other ants and beetles are more common food for them. 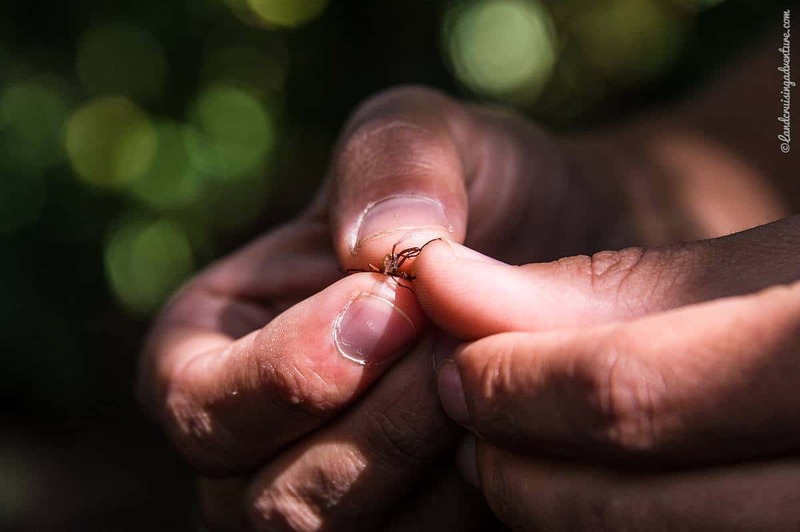 Indigenous people use the ants to stitch wounds by holding the razor-sharp pincers over a cut in the skin and when the ant bites, breaking off the head so the pincers keep the cut together. Not too far from the paper wasp nest we noticed this rolled-up leaf. It looked as if it had naturally curled up until David pointed out that it hadn’t. 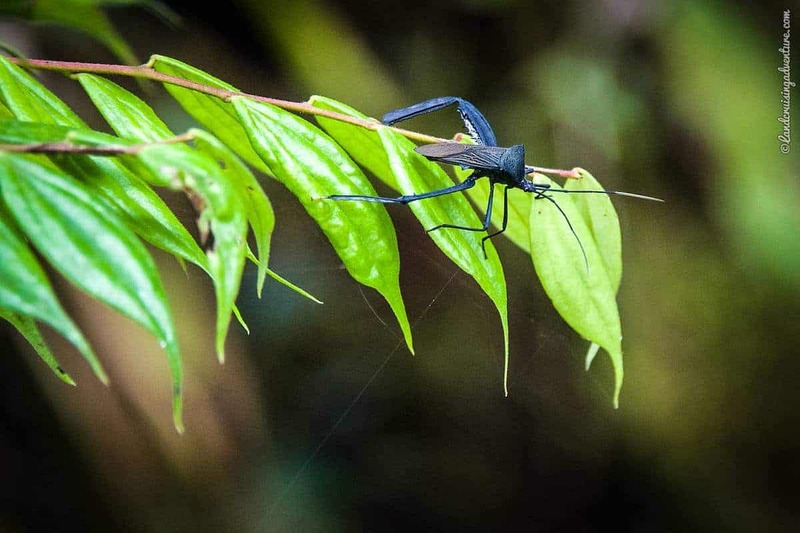 The owner of this little home, a spider that belongs to the black widow family, had made a nifty nest by rolling up a leaf into a hollow, tube-like shape and keeping the leaf in place by using the strongest natural thread available: its own silk. These trees, belonging to the Socratea family, are capable of moving three to four meters in their lifetime, which they do in order to get closer to sunlight. The trunk is not anchored in the soil, but the tree stands on stilt roots. It can ‘walk’ by growing new roots on the side it wants to go to and letting the original roots rot away. The roots are so coarse that people use them as graters. One of the projects at the reserve is the Butterfly Life Center. Here, amidst the cloud forest the lodge’s resident biologist does research in cooperation with the University of Sheffield to hopefully discover which gene governs the structural colors of a butterfly. 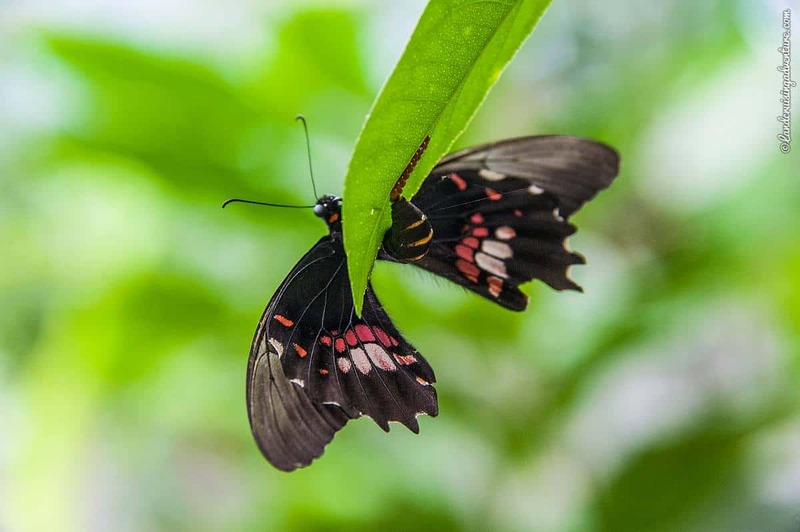 While this is going on behind the scenes (although you can see the biologist’s work at the butterfly farm), most visitors focus on the 17 species that flutter freely in the center. The biggest is the owl-eye butterfly but we were most impressed by the glass-winged butterfly. This article was first published on Matador Network. To stay at the Mashpi Eco Lodge, check availability here.